Discover the power of mixed models with SAS. Mixed models-now the mainstream vehicle for analyzing most research data-are part of the core curriculum in most master's degree programs in statistics and data science. 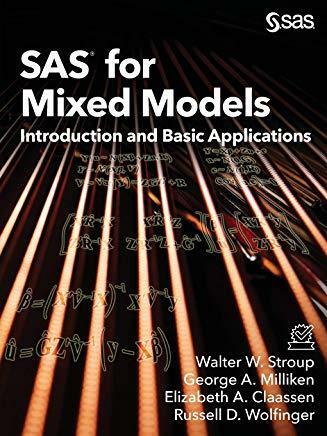 In a single volume, this book updates both SAS(R) for Linear Models, Fourth Edition, and SAS(R) for Mixed Models, Second Edition, covering the latest capabilities for a variety of applications featuring the SAS GLIMMIX and MIXED procedures. Written for instructors of statistics, graduate students, scientists, statisticians in business or government, and other decision makers, SAS(R) for Mixed Models is the perfect entry for those with a background in two-way analysis of variance, regression, and intermediate-level use of SAS.